Thanks for the photo! 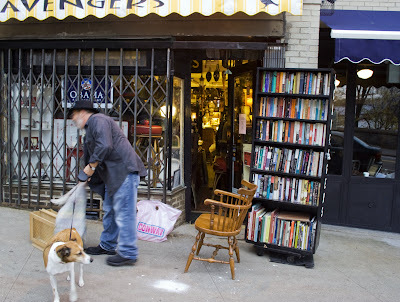 I lived just up the block and around the corner from Scavengers for many years; nice folks own the place. The male co-proprietor is British and plays guitar. I like your project. Interestingly enough, a friend of mine--a jazz sax player named Mark Reboul--did the same thing you're doing, many years ago. He didn't take photos, though. He just walked every single street. (Or claimed he did. I trust him.) At one point he sent me a card. "You live near the most obscenely-titled intersection in Manhattan," he wrote. "Seaman Avenue and Dyckman Street, just down from Cummings." Great good luck with your quest! The British co-proprietor is Guy Cooper, who ran Scavengers with his wife, Lela, and who was also a photo editing legend at Newsweek for several decades as their director of photography for the international edition. That's him in the photo with his dog, Rupert. So sad Scavengers has closed!